I started my career in advertising. Back in the day when every brand finally had a decent website and wondered whether they needed a mobile app next. I worked on a whole range of projects: from very small campaigns, to bespoke flagship apps for large fashion clients, to sponsoring worldwide sport events. And it was great! I got to work with quite diverse brands, who all had their own target audience and style. I worked on various different platforms, keeping in mind the particular goals of each brand. But I didn’t learn that much from my designs. I never found the chance to add testing to our budget. Collecting data in a live app was often an afterthought. And iterating on an app barely happened, not to say never. As a kid straight from school, I was therefore not able to verify whether my designs would actually work. My peers at these agencies were no help either, as they also just started to figure out how to design for mobile. That’s why I moved from advertising agencies to a product company, and started working at Spotify. And boy, was this exciting! I was able to dig through 5 years of data, understanding how people used the app, where they went, what they listened to the most and where things got complicated. Rochelle King, VP of Data, Insights and Design at Spotify, was (and still is) a great mentor in understanding how to look for the right data, how to interpret it and how to use it. Still, I was scared. At the time I’m writing this, Spotify has around 75 million active users. And that’s not a number you want to play with. Each design decision you make, could have an effect on that number: either positive or negative. Sure, we have test environments, and the ability to A/B test certain concepts, but never is it possible to test everything, let alone all together. I like to say that creative people are confident in only one thing: their own doubt. He argues that succeeding in building something new and significant from the first time is highly unlikely; doubt is all we have to rely on. So how does one get comfortable with their own doubt? How does one create the self confidence needed to use their doubt as power and not as fear? During the process of a project at Spotify, I often find myself in-between two extremes. On one side, there’s the artist: the alternative character who believes I should trust my gut feeling, focus on the aesthetics and express Spotify’s brand and values. The other side holds the scientist: the objective analyst who tells me to collect data, follow the numbers, and rely on facts over emotions. I see myself often rocking between these two mindsets. I have to admit I favour the scientist more than the artist, not because I think she is right and the artist is wrong. I rely on her more since she’s within my comfort zone. I’ve never been a strong visual designer. I come from a technical background, spending more time on wireframes and architecture than defining a graphical style. Which colours and fonts express our brand values best? To me, this is still a vague concept. I’m biased towards my scientist and have a hard time trusting the opinion of my artist. But is there a right and wrong side? Do I rely too much on my artist because I started in advertising? Or do I trust my scientist more now that I have access to data? Is there even a need for an artist in Product Design? Or is the scientist too safe and slow to be fast and agile? Let’s go on a trip. Lets go to Roses, a small town in Spain about two hours from Barcelona. I’ve made reservations at a restaurant, and I promise you: it will be the best food you ever had. You’ll get about 36 different small dishes, in about 3 hours. All of them peculiar, beautifully designed and with ingredients you probably won’t recognise. And that’s not the point either. What matters is what you taste. It’s a journey for your senses to redefine your definition of taste. This restaurant actually did exist. It was called elBulli, and it was one of the best restaurants in the world, receiving three Michelin Stars. elBulli’s chef, Ferran Adrià, had a very particular way of working to achieve such greatness. During the summer, elBulli would run at full capacity. For 6 months, the restaurant would welcome around 120 guests each night, serving these 36 recipes, each 4 hours. The kitchen would run like clockwork. The guests didn’t choose from a menu, but were guided by Adrià’s selection. This selection only changed slightly over the course of those 6 months, heavily based on what ingredients became available during that time. As impressive as that might be, the most interesting part is what would happen in the remaining 6 months of a year: elBulli would close. Adrià and his sous chefs would leave the restaurant and move to a much smaller kitchen in the heart of Barcelona, close to the market. For 6 months they’d do only one thing: experiment. Regardless of how many times they might have used it, they’d buy an ingredient and prepare it in any way possible: frying, cooking, marinating, freezing … the possibilities were endless. At this stage, the goal of these experiments was not to define the menu for next year, but rather to create insight and to understand, explore and innovate with both new and existing ingredients. Each “test” they’d do with an ingredient was documented. Attempting to be as objective as possible, the sous chefs would write down what happened to an ingredient when it was prepared in a certain way, what it tasted like, what it looked like and how it behaved. Personal opinion had no place in their small kitchen. Nor were they limited by a menu or a direction. It’s only at the end of these 6 months that they would move back to the restaurant and start creating the menu. This is when they’d combine prepared ingredients from their research and look for unique tastes. These combinations were the signature of elBulli. The tastes they produced played a major role in the experience the guests would receive, and what ultimately defined the reputation of elBulli. Adrià would provide the final verdict on what would pass and what would not, with the support of around 40 chefs. elBulli is a beautiful example of how science and art create greatness together. These first 6 months of experimenting are what scientist would call “research.” The actual art is created based on this research, bearing in mind what elBulli stands for and what experience it delivers. At Spotify, I’m part of the Glue team. Our team looks after the Global Language and the Unified Experience. We protect how the brand is represented in our different clients, and we provide tools, patterns and templates for other designers in the company to maintain consistency. More specifically we maintain Design Principles as well as Guidelines. The Design Principles are abstract definitions of what characterises a delightful Spotify experience. The Guidelines represent these Design Principles in more concrete form through styles, components, patterns and templates. The Design Principles are goals towards which we work, both within the design team and throughout the company. Content First: People come to consume content. Prioritise that above all else. Be Alive: When there’s always something new or about to happen, people will return. Stay Authentic: We stand behind what we say. Always deliver on a promise. Do Less: The experience should feel effortless. Get Familiar: Personalise the experience. Humanise Spotify and people will engage and have fun. Lagom (Swedish for “just right”): Through craftsmanship and attention to detail we strive for perfect balance. Whenever we design something new for Spotify, we attempt to verify its design through these 6 principles. An experience that utilises them, is an experience that is key and unique to Spotify. The Guidelines, on the other hand, are the ones you see used throughout our different products. They range from small stylistic elements such as fonts, colours and icons, to components such as track rows, cards and buttons, and further on to larger entities such as headers, modals, menus and carousels. Just as elBulli likes to experiment with the bare essentials, in Glue we like to questions the effectiveness of these components in regards to the Design Principles. A track row might look like a dull simple component, but it has huge influence on the perception of our products as it’s used on so many occasions. Imagine we’d attempt to simplify the track rows. Maybe we make the fonts smaller. We could take the lines away or the circle around the context menu. Is such a track row more in line with our brand? Or does it become difficult to use because the boundaries are less visible? Is the simplified version more “Do Less”? Or is it less “Content First”? On the other hand, lets say we’d like to add elements to the track row. Maybe we add the artwork of the album on which the song appears, or we use alternating background colours to create clearer distinction. One might argue the artwork makes the row emphasise “Content First”, though someone else might say it’s doing the opposite of “Doing Less” since there’s more content to scan. Our goal is to craft every single component so that it meets our Design Principles to the best of its ability. The way elBulli experiments with ingredients is what inspires us to question and verify each component. We hope our designers can create beautiful experiences within Spotify through our Design Principles and Guidelines, just as elBulli creates delicious experiences through the recipes from their experiments. With Glue we believe it’s very important to express the brand in our products. So is the need for our design language to evolve responsively and adapt gracefully in function of changing behaviours, new platforms and new standards. Christopher Nolan likes to do things differently. In Interstellar, he barely used green screens. In The Dark Knight Rises, he dropped an actual plane. And in Inception, he blew up a café, created a full rotating corridor and flooded an entire set. He roots his scenes firmly in reality and is not a fan of computer generated effects. But how does one shoot an effect that can’t be recreated in real life? I won’t spoil anything, but I will mention there was a need to create a black hole somewhere in the movie. Unfortunately, space travel doesn’t allow us to visit one just yet, so Nolan had to rely on CGI to create these scenes. But even here, he questioned the status quo. As black holes have never been seen from up close, we often see an artistic representation of what a black hole could look like. These are often created more to look dramatically appealing, than scientifically correct. Nolan saw it differently. He worked with Theoretical Physicist Kip Thorne who is well known for his work on gravitational physics and astrophysics. 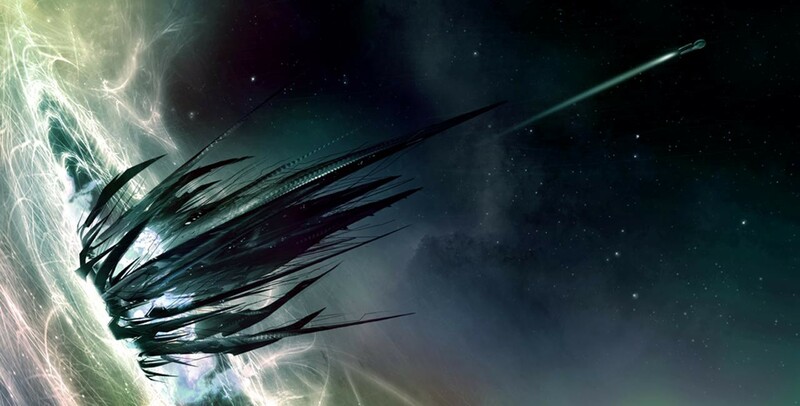 Nolan asked Thorne what a black hole would look like, based on all research done so far. 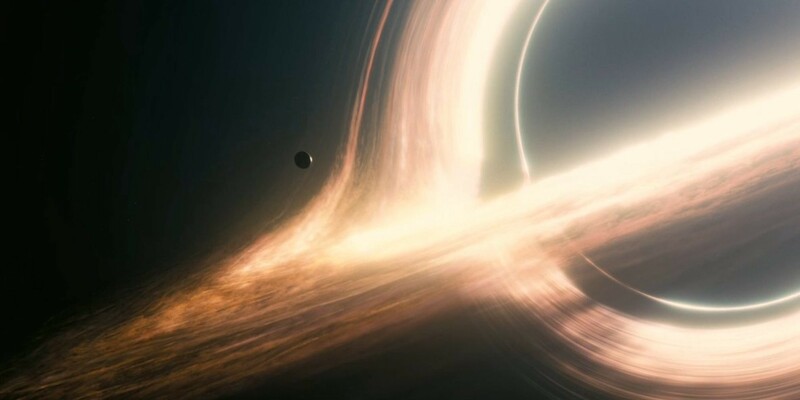 He became an Executive Producer on the movie and worked with both his team of researchers and the Interstellar team to create a scientifically correct representation of a black hole. In this particular instance, Nolan stepped away from his own storyboard, and allowed Thorne to define how the scenes around the black hole would manifest. Based on this scientific representation, Nolan had to optimise his shots, camera angles and lighting. In return, all of Thorne’s research created a whole range of new insights into the science behind black holes. It was Thorne’s science combined with Nolan’s artistic vision that created these beautiful shots in Interstellar and defined a large part of its story. When Spotify introduced the Browse feature almost two years ago, we categorised our playlists into different sections. As you’d expect, many of these categories were genres: pop, rock, soul, hip hop, RnB … this seems obvious. Music has had many genres in its lifetime, and was categorised in these buckets long before digital, let alone streaming, music existed. A few months into Browse’s existence, we noticed these moments were becoming very popular. Many of them had a large amount of daily listeners, often more than the most popular genres, like pop or rock. This wasn’t anything we really expected to happen, but it did result in a big change in our products. Based on this insight, we experimented with more of these moments and added categories such as sleep and travel. It was then we also kicked off initiatives like Running, Party and Now. Interestingly, these decisions were completely data-driven. We relied on the science of numbers to tell us how to move forward. Just as Nolan adapted his movie based on Thorne’s research, we adapted Spotify based on what data told us was most popular. Spotify lives in both a very competitive and innovative industry. Streaming music is still very young and large parts of the experience still need to be defined. We have a responsibility to allow our product to grow. Only then can we innovate and try to stay ahead. But we have to be honest about its desire and be willing to learn about how our product is used. The team at Spotify can act as the artist that creates the Spotify experience, making it unique and on-brand, but we have to be comfortable to let a part of creativity be defined by the science of data; only then will we know we’re heading the right direction and we serve the many as well as the few. James Turell is an American artist who works with light and space to create immersive environments like the ones you see above. Artist like Turell, Dan Flavin or Olafur Eliasson have always inspired me. When you’re standing in a space created by one of these artists, everything feels very artificial. You have no clear sense of where a wall starts or ends, where a light source is or how the effect is created. Because of the magnitude and scale of these works, you quickly become immersed in their art. Even though you might not feel what the artist wants to express, it is difficult to not feel anything at all. For every exhibition I visit, I look at how the artist uses the museum space. Why are there three paintings on this wall, but only two on another? Why are these paintings near a window with natural light? Why are these walls black and the others white? What paintings are in the smaller rooms versus the bigger rooms? For artists like James Turrell, these questions become essential, as the room is the art. Their art depend so heavily on the room it’s in, the artist must observe, respect and understand the architecture of the museum first. Only then are they able to successfully express the art created within. An exhibition in one museum might look vastly different from the same exhibition in another museum, all because museum architecture changes. The artist has no choice but to adapt the art to the space he or she receives. That is what makes this type of art interesting. 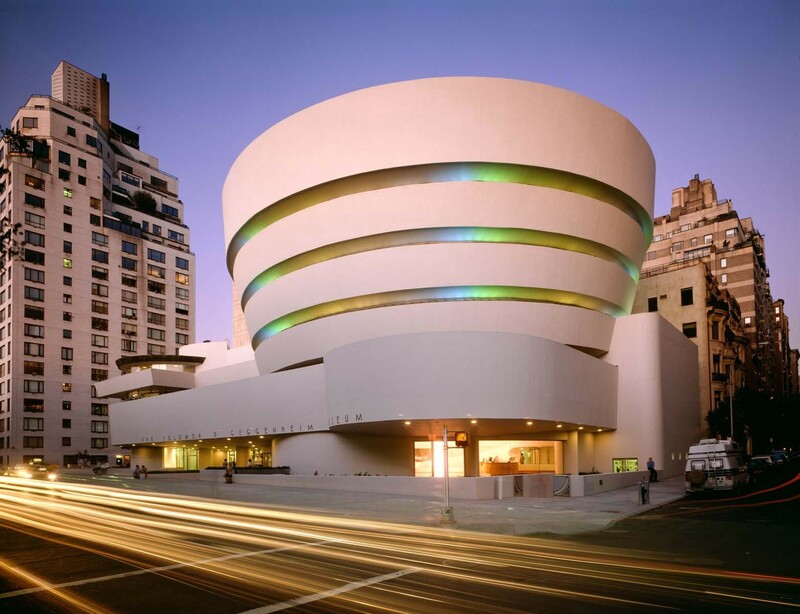 For example, this is what Dan Flavin did with the Guggenheim Museum in New York. Artist like Dan Flavin have to look at the architecture of the museum, the materials it’s made of, the usage of natural light in the different halls … Once observed, they are able to establish their art in the space. Dan Flavin’s piece of work illustrated above is impressive because the Guggenheim’s architecture is impressive. The same piece of work in another museum might not create the same effect. 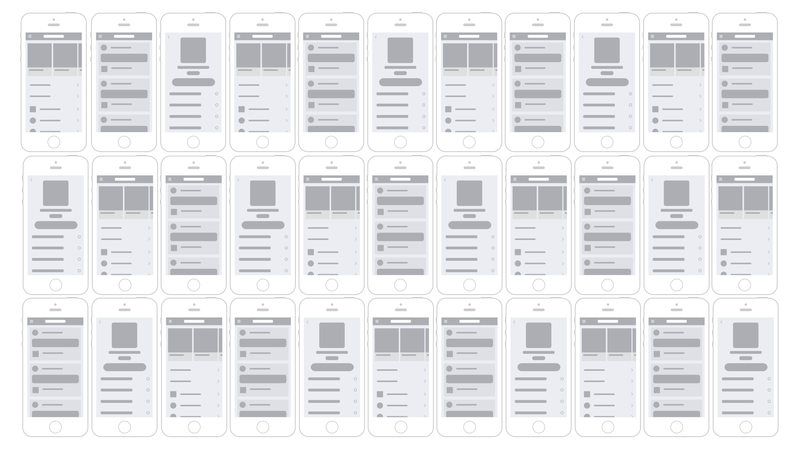 The Glue team at Spotify spends a lot of time making systems for designers to rely on. We have grid systems, typographic systems, colour systems, button systems … These are quite obvious things when talking about style guides and guidelines, but we are asked more and more to look deeper than just the visual layer. Lets take the Spotify app on mobile: new views are added with every release. This might be because we have a new feature, new content or need additional screens to improve flows. To keep cognitive load as low as possible, we have to make sure all views feel familiar to the user and meet their expectations. Constantly bumping into new views that look and behave differently, makes the app difficult and exhausting to use. You never know what to expect. So we’re trying to keep a holistic view of the entire app. We look at all views and try to see patterns that can align. We do this by trying to abstractify the page. We look at the order of information, the hierarchy, the primary and secondary actions … We try to find similarities and create templates based on these. At the moment, we’re focussing on three main templates: a feed, a hub and an entity. A feed could be Activity or Recently Played. A hub could be a genre or a moment like Running. An entity could be an Album, Artist or Playlist. We define the architecture of each template, so that other designers can apply their content to it and make it their own. Through this architecture, we try to keep our product as consistent as possible. We hope to speed up design by starting with these reliable templates. For example, these templates should make it easier to translate Spotify to new platforms like TV or car. If we figure out what a feed, hub and entity look like on these platforms, we can translate all different views much faster. Artists like James Turell and Dan Flavin look at a museum first: its different halls, its layout and flow. Only then are they able to install their art in the museum by using these characteristics. A completely new room is rarely created for an exhibition. We try to create a similar state of mind within Glue by creating a strong and versatile architecture. We do this by designing systems and templates that are abstract enough to be used for many use cases, yet strong enough to create alignment and consistency. Glue’s hope and goal is to have an architecture that challenges and inspires designers to work within. As a design team in a fast and agile company such as Spotify, ironically we appreciate when designers (including the Glue team) take their time to slow down. We ask them to look at the whole holistic experience on all platforms, and understand why there’s a need for a design language and architecture. 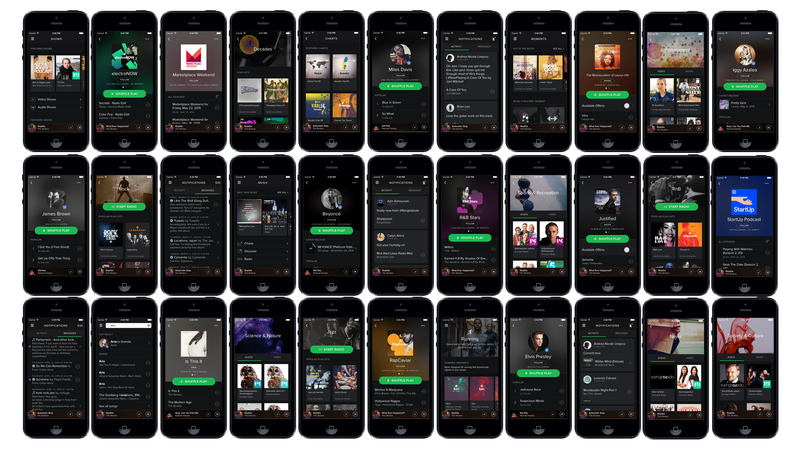 Only then are we able to create immersive and consistent experiences, regardless on where you use Spotify. Our foundation is in place, but we’re working hard to make this a habit and a characteristic of our product. What begins with intuition is fuelled by insight. If you are lucky, these reinforce one another. elBulli has the intuition to create brand new and unique flavours, and uses their insights from 6 months of research to fuel it. Christopher Nolan has the intuition to be as realistic as possible in his movies, and uses the insight from Kip Thorne to empower it. And artists like James Turell and Dan Flavin have the intuition to create immersive beautiful rooms, and use their research on the architecture, material and natural light of the museum to do so. At the beginning of this article I mentioned I often had to choose between two mindsets: do I rely on my scientist and the data she provides, or on the artist who tells me to follow my gut feeling and personal taste? None of these 3 stories in this article choose a single side to rely on. What makes these projects so successful and powerful is their ability to combine science and art and make them collaborate. And no doubt there are plenty more examples like these. 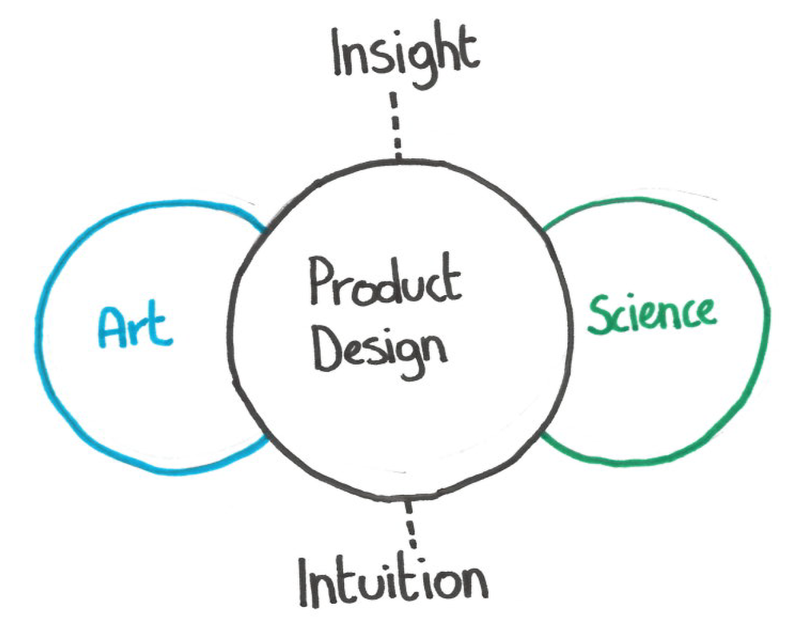 I believe good Product Design can only come from respecting both the process of art and science. We have to listen, question and learn from both sides. Intuition is a great starting point and can give direction in which to go. We must build upon that intuition by questioning, changing, improving and empowering ourselves through insight and research. This is what I aspire to do as a good Product Designer. The process I’m trying to find, establishes on the necessity to understand both art and science. It should have both sides equally represented and the ability to take the best from each. I’m not there yet. I’ve only been in design for 6 years, 2.5 of them in Product Design. But I hope this process will give me more insight, so that my intuition becomes better and more reliable. Only then can I be less scared. A special thank you goes out to Rahul Sen, Dominic Parewijck, Kalle Persson and Sarah Gainer for providing inspiration, guidance and feedback. I couldn’t have written this without you. Thanks to Dominic Parewijck and Kalle Persson.